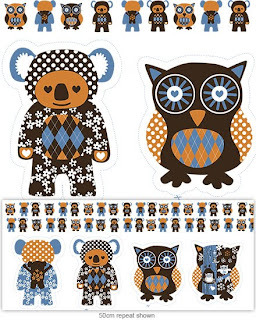 Fabric designer Saffron Craig just released two new items: the adorable Owls in Trees fabric is now available in a lovely chocolate brown colourway and how about these cute Owl and Koala softies? Owl and Koala are ideal if you want to give a hand made present but are a bit pressed for time and/or lacking in sewing skills. 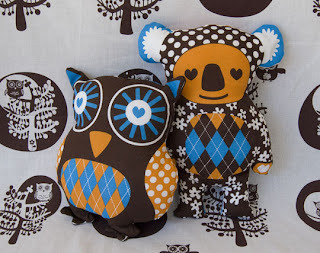 They come in a 50 cm piece of fabric which includes both the Owl and the Koala (front and back) and the two little strings of Owls and Koala's you see in the picture. I'll be ordering them for sure! I also read that there will be a $10 gift voucher for newsletter subscribers, so head over to Saffron's website if you are interested! What fun! The first thing I ever sewed, when I was about 5, was a strawberry pillow that was one of those cut-out-and-sew-together type projects. Maybe I should do the same with my oldest . . . hmmm. I didn't know there were softie panels. Yay! No searching for the perfect fabric. Great site.